The latest trend in Bangkok seems to be dog fighting. Not the cruel sport pitting canine against canine, mind you, but the culinary sport pitting hot dog vendor against hot dog vendor. Thankfully, the winner of this contest is the frankfurter-hungry consumer. Two hot dog companies have opened recently: Superbdog and Corn Dog Dude. Their promise is true American style hot dogs. Accompanied by my Floridian friend John, we set out on a recent evening armed with antacid tablets, ready to try both companies’ offerings. Our first stop was Superbdog. The name doesn’t roll smoothly off the tongue, but that is a minor complaint. Superbdog is the brainchild of an American named James, who has spent several years perfecting the recipe for a quality all-beef dog, locally made to his specifications. Good cuts of meat are used instead of castoffs and trimmings. In addition to a beef dog, an all-pork dog is available. 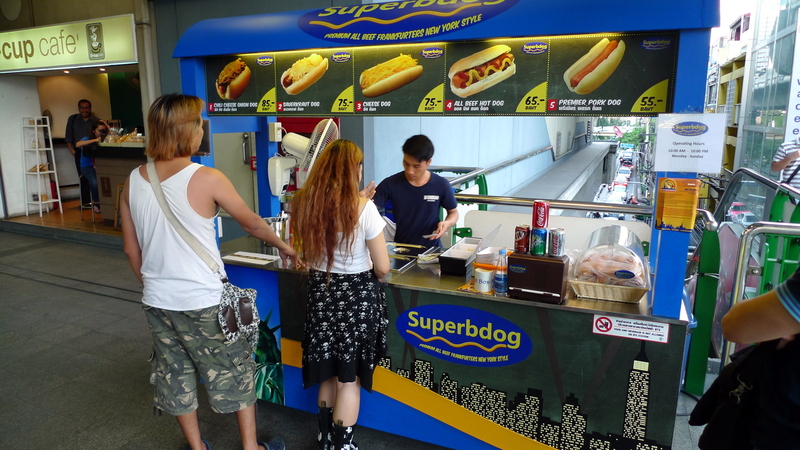 Currently, the only fixed Superbdog location is a cart in the Nana Skytrain station, just outside the east ticket gates. In the evenings, additional carts can be found roaming the streets in the neighborhood, helping meet pub-crawlers’ less carnal hunger pangs. There is no seating other than a pair of plastic stools off to the side of the cart. Additional locations are planned. The cart is spotless and the vendor was tidy and paid attention to the details. Notice how the ketchup is squirted on with wide strokes, providing good coverage. Dogs are simmered in water and a choice of traditional toppings (onions, sauerkraut, etc.) are available. 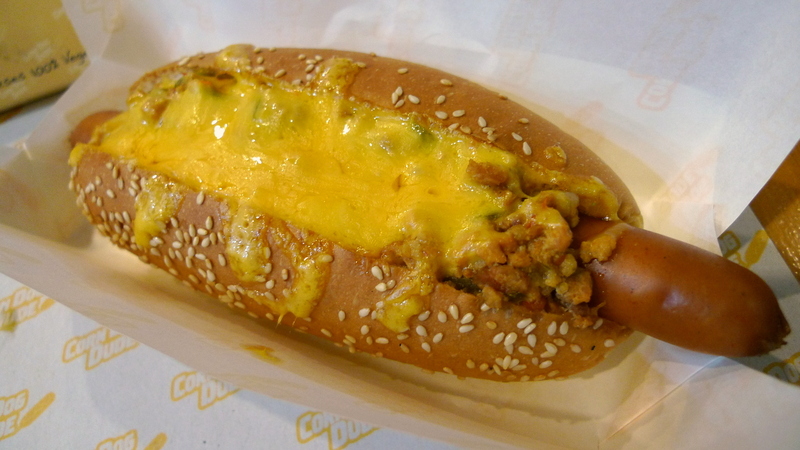 There are about five basic options so we chose the chili cheese dog as the stick by which to measure both shops. The hot dog itself has a bright pink color, a bit brighter than you might think it should be. James assured me that there are no preservatives or artificial ingredients, and the flavor of the link was fantastic: nice and beefy with a smooth texture and a solid, crisp “snap” when you take a bite. The other components all meet expectations: solid bun, basic bean-less chili, fresh onions, and real Wisconsin cheddar cheese. Now, I will say that chili is a contentious dish. I prefer mine with tomato paste and tomato chunks in it, moderately spicy with a distinct flavor of dried chilies. The Superbdog chili is a bland brown and while it tastes fine, it looks a bit unappetizing. All in all, though, the chili dog is a good value for 85 baht (less than US$3) and if I am in the area, I would seek it out. 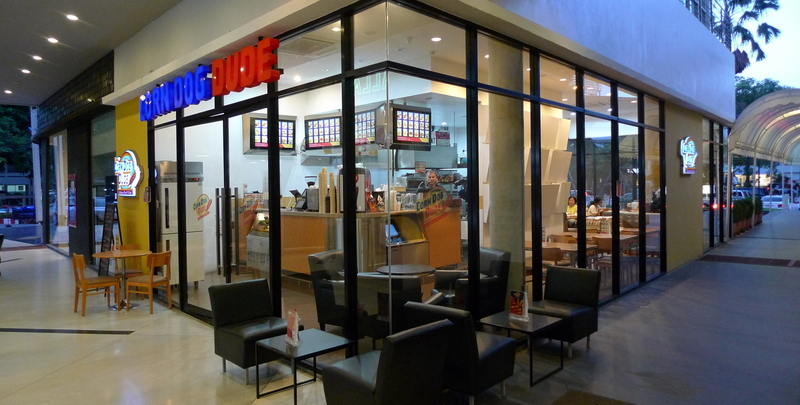 Located in the K-Village shopping center at the end of Sukhumvit Soi 26, Corn Dog Dude is run by a French Californian named Pascal. The shop has been open the better part of a year and is suffering from the slow traffic that is left now that the shine has faded from this previously trendy community mall. The spotless shop has an ample dining area with additional outdoor seating. The menu is much more extensive than at Superbdog but, unfortunately, there is no all-beef hot dog. There are, however, all-pork and all-chicken options, both of which are locally made to Pascal’s specific recipe. Corn Dog Dude’s chili dog offers a different meat to bun ratio, which John and I both preferred. The buns are specially made in small batches by a local baker who delivers daily. They are a softer bun with sesame seeds and are interesting in their own right. The hot dogs have a nice flavor and good texture, although the lack of an all-beef dog is a disappointment. The chili at Corn Dog Dude is about the same as Superbdog’s. If I were in the kitchen, I would modify the recipe to make the chili more notable. The big winning point: melted cheddar cheese. Because Corn Dog Dude has a proper indoor kitchen, they have access to a salamander, so melted cheese is easy. This makes a difference. As you might expect from the name, Corn Dog Dude’s menu also includes corn dogs. I had a spicy dog that has chilies in the batter. These are well-made and the batter comes out flavorful and crisp without being oily. On a subsequent visit, I also tried the nacho dog, which is a hot dog with all the makings you would find for nachos, including chips. An unexpected treat was the deep-fried dessert items. The Oreos and marshmallows didn’t do much for me but the deep-fried Snickers were fantastic. I know this has become a thing at county fairs in the US recently and I had always dismissed the idea as obscene. 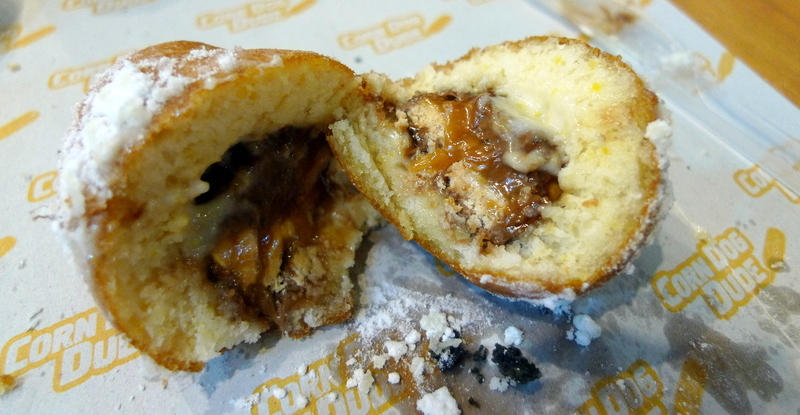 But I gave into temptation and tried a deep-fried Snickers and while I wouldn’t eat one every day (heaven forbid! ), I found them surprisingly, guiltily tasty. Anytime this city gets greater variety and higher quality food, I think we have reason to be pleased. In this case, both vendors provide very good hot dogs. 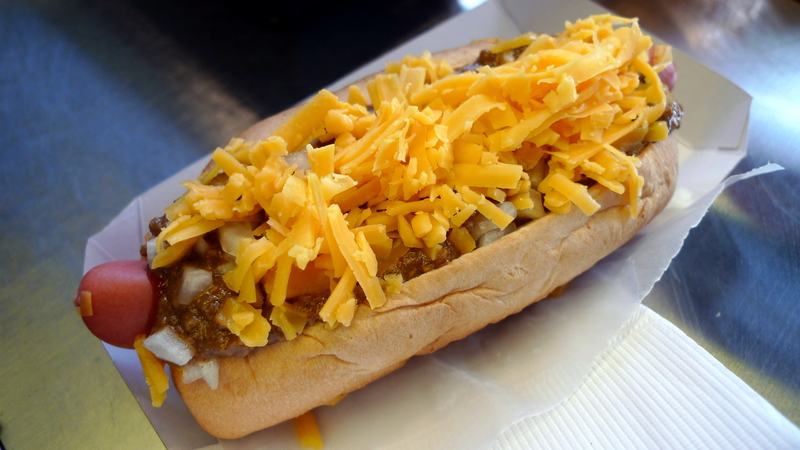 I really like Superbdog’s all-beef hot dog, although the chili and lack of melted cheese left me less excited. I really like Corn Dog Dude’s buns and corn dogs, although wish there was an all-beef option. Recognizing that taste is personal, I think you should try them both and see what you prefer. Let me know what you think. This entry was posted in Food and tagged Bangkok, Chili, chili dog, corn dog, corndogdude, Dining, food, hot dog, Restaurant by christao408. Bookmark the permalink. I too love the “snap”. Yes – the sign of a good dog. Sauerkraut dogs are fantastic, especially with a nice rustic brown mustard. I first assumed you were going to write about dog fighting. Ok, hotdogs it is then. 🙂 Do these shops have the tourists in mind or the locals? The one located at the Nana station is definitely geared to tourists and expats. The Corn Dog place is trying to attract a broader crowd but, honestly, I don’t think most Thais will “get it”. 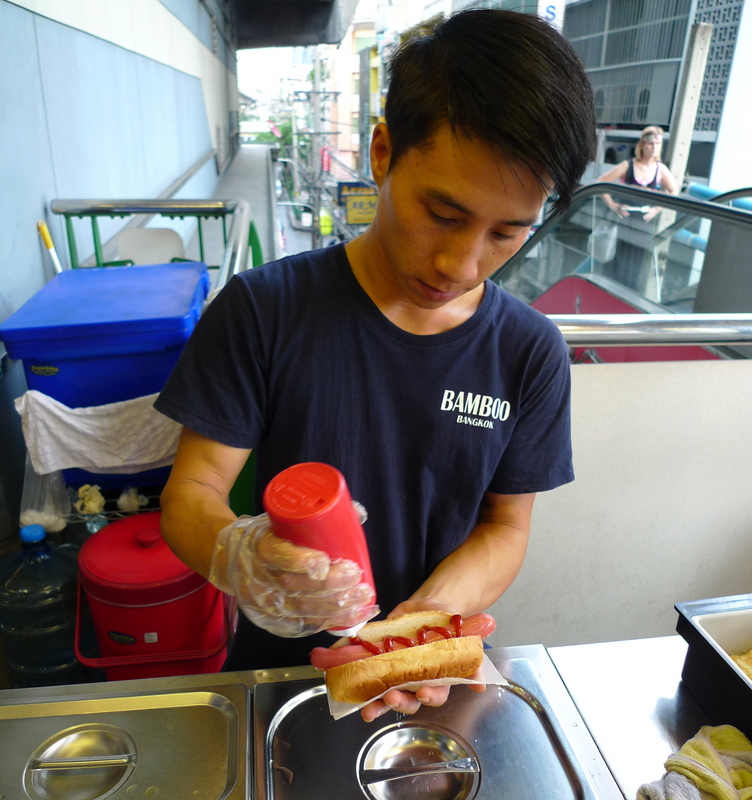 Well, Thailand does have a sausage tradition but done very different from hot dogs. Yes, I know that sausages are not totally uncommon, but as you wrote, it’s a very different sausage tradition. It’s a whole different wiener. So nice to visit you at your new “home”! 🙂 nice photos as always! Didn’t realize you have your own site! All of those look awesome. I know there is a Japadog here in NYC at St. Marks. I’ve only been there once, but I want to go there again and pretty much try all of their items. Have been hearing a lot about Japadog. Am curious to try. Yay! I’ve found Matt. Now my WP world is complete.